I did it. 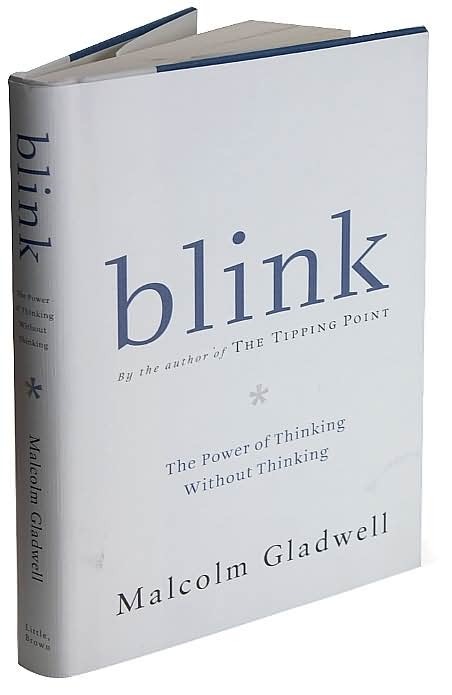 By finishing the book "Blink” by Malcolm Gladwell yesterday, I am now done all of the Canadian author’s four books (The Tipping Point, Outliers, and What the Dog Saw being the others ). All of them were entertaining reads although Blink, the #2 book in the quartet, was probably the least enjoyable of them for me. Blink’s main message is whether it is better for us to rely on our instincts when making decisions or whether studying a situation for a long time, then making a decision is a better idea. Gladwell, as he does so successfully in all of his books, is able to sway your opinion to the former being true and throughout the book he points to examples as to why this is the case. One striking example in the book Gladwell uses is the real story of a group of 4 police officers in New York City and their misjudgement of a “criminal” who they shot at 41 times to death. The “criminal” was merely an innocent civilian. Gladwell goes on to argue that if the officers had studied the situation better, particularly his face, which would allow them to read his mind, they would have seen the man as not a threat, and would not have made the decision to kill an unarmed man in cold blood. This was the most fascinating part of Blink. Some other parts of it gets repetitive at times. Perhaps this is because I was so used to Gladwell’s writing style. Nevertheless Blink sticks true to what is typical of a Gladwell book by being thoroughly researched, thought provoking, with a great, tight narrative. So with that said, and now having read all of Gladwell’s books (thus far), what you come away with from this quartet of books is the common themes of very interesting social experiments, stories, and case studies that allows you access into a deeper understanding of the people, situations, and world that we find ourselves in. It is fascinating how oftentimes we tend to view things as completely open and shut, but through Gladwell’s books he continues to refute this notion showing that , in fact, there is really another way(s) of approaching things. For me, who has a strong interest in research, building relationships, and being a part of my community, my interest in the books was constantly piqued. I couldn’t put any of them down while reading them mostly on the commute to work. I’m glad a friend of mine, who was chided by his boss to read more, has taken that challenge and recently started Outliers. He is in for a treat.